It wasn’t easy – but it’s completed! Yep, EVERY CARS, CARS 2, Toon, Storyteller, Holiday, Expanded Universe AND even non-canon CARS diecast – including ALL major variants from 2006 to 2013 … in one magazine checklist. 8 Years worth of CARS diecasts in alphabetical order. All new design and all re-done. 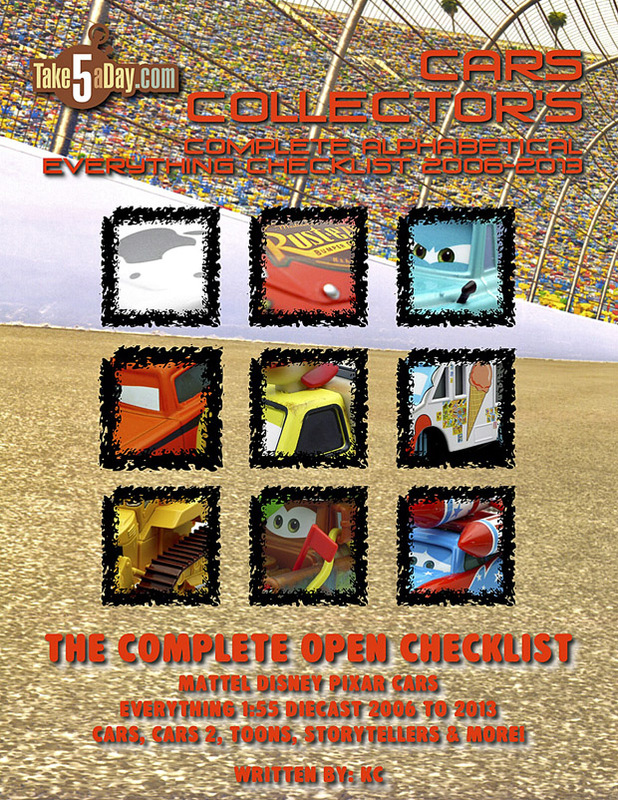 CARS are listed as CARS, CARS 2, Toons, Expanded Universe (Disney store, theme parks, books, magazines), & Non-Canon (Blu Ray McQueen, Pirate Mater, etc – but you want it anyway). Over 700 high -res photos – sharp enough to see the segmented faces. 🙂 I even back to check on the official names on many of them (BTW, this is a prelim page screenshot so it may have changed but the live interactive preview shows the issue as it stands now). Every major variant is shown … SPOILER ALERT … the count for complete collectors? 782 is the count – which includes every major variant. Of course, everyone’s count will vary. This 782 counts every release for CARS, CARS 2, Toons, relevant Disney Store releases (5, I think), expanded universe CARS (Storytellers, magazine, etc) and a few non-canon releases that are from Mattel so they are counted (such as Mickey Lightning and Blu Ray Lightning McQueen). 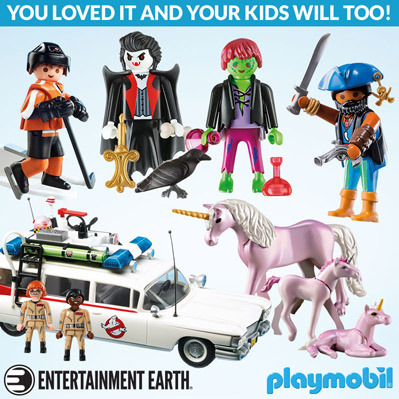 This also includes @13 lenticulars not available as classic fix-eye releases (for example – such as segmented Cruisin Lightning McQueen or Mater with Blue Hood …). This count also include major variants, separate rubber tire racer releases and of course, haulers. So, that’s the target for most collectors – @782 CARS diecasts. However, if you’re an absolute completist – if you collect and count every minor variant plus lenticulars releases of 2009 & 2010 as separate releases (as variants or as versions) – then we stand at 938 after 8 years. And counting the @35 PLANES/PLANES Pitty’s and “new” 2014 CARS releases (not included yet), then we’re at about 975 … leaving us about 20 releases until the big 1,000 mark – most likely a PLANES: Fire & Rescue release. Yep, holy cow – ONE THOUSAND. Pretty amazing – is the Star Wars 3 ¾ inch line at 1,000? GI Joe? Barbie? Hot Wheels is obviously there but how many other US toy lines is at 1,000 releases in one scale? Until then, enjoy the magazine checklist of the first 8 years of CARS World. You can also click for a PREVIEW. To avoid confusion, I have deleted all the other “recap” issues so there are only two now. This one which covers everything in alphabetical order and our other recap checklist which lists CARS releases YEAR BY YEAR will be updated next month. 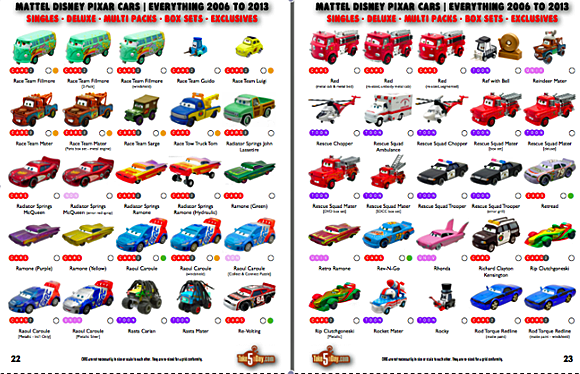 All the numbered issues cover everything released that year only – one motif/theme per issue (some themes/motifs cover more than 1 year like CARS 2 Porto Corsa). Thanks for your support of TakeFive! I noticed a long time ago that the Disney store sumo wrestlers are smaller than Mattel’s and their Red is virtually the same size. Any comment there? Just wonder if anyone else was curious about that. The Disney Store sumo wrestlers and the Queen are smaller than Mattels, and in my eye, better scaled, so I ditched my Mattel sumo/queen Cars. The DS Red is just a tad larger, again better scaled, and far better detailed, so I prefer those. The DS apes work well too, and if you want Big D, that’s the only way to get him. Yeah for being a fire truck I thought the DS Red was better too. I don’t have any of the DS Apes yet. I do have Big D and until I got this latest checklist magazine it hadn’t occurred to me that he is in a closer scale to Mattel’s and the same size as Santa Car. MET- just ordered it, look forward to receiving it in the mail. Ive held out for many years on buying your books, only because I knew someday tho should arrive. Are you going to do a Disney Store one??? I been curious if we’ll allow the Disney Stores Battleships, Turbo Loft and Siddeley. They are much bigger and better than the retail versions. (MET: Yea, I consider them canon – not included as it’s not diecast – but if there was space, I would’ve included them …). Thank you Met! What an accomplishment! RELEVANT Disney Store releases? There’s an oxymoron if I ever heard one!